Meenakari Steel Tray with Peacock Design Big Made of steel Size 1.5"x12"
products such as Pooja Articles &, Copper Wares. We are offering a wide range of Steel Tray to our patrons. These products are made from high quality components. In order to retain remarkable position in this industry, we are providing a wide array of Steel Tray. 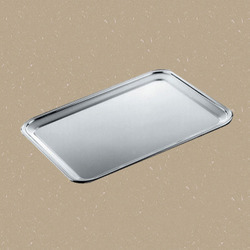 Our reputed organization is engaged in offering a wide range of Designer Steel Tray. 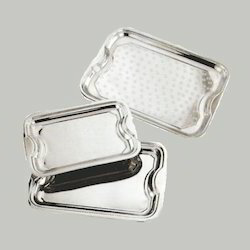 Available in a wide variety of sizes, shapes, these stainless steel trays are carved out of high quality steel and have mirror finish. Specially designed to keep the different ingredients, they can be used for serving purpose. They are a delight for the eyes and carries an elegance of their own. Steel trays with brass handles 8x8"